You should have seen the toe nail clippers. We have seen a lot of Buddhas on our trip. It isn’t uncommon to find 10,000 Buddhas in a single shrine or museum. We see them in stores, hotels and at the countless shrines we’ve passed or visited. It wouldn’t surprise me if we’ve seen upwards 100,000 on the trip so far. But yesterday, we saw a Buddha that stands out from the crowd. 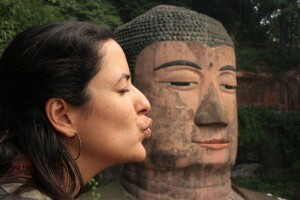 It’s official name is the Leshan Giant Buddha, but I like to call it mega-uber-Buddha. See Buddha's calm disdain for Sasha's affection. 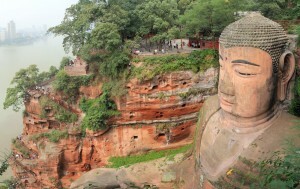 In what was described to us as a “small village” near Chengdu, population 3.7 million, sits the polluted city of Leshan. 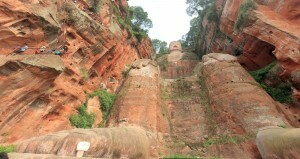 Carved out of a cliff face at the junction of two rivers, mega-uber-Buddha was commissioned by a monk during the 8th century to tame the turbulent waters for boats. 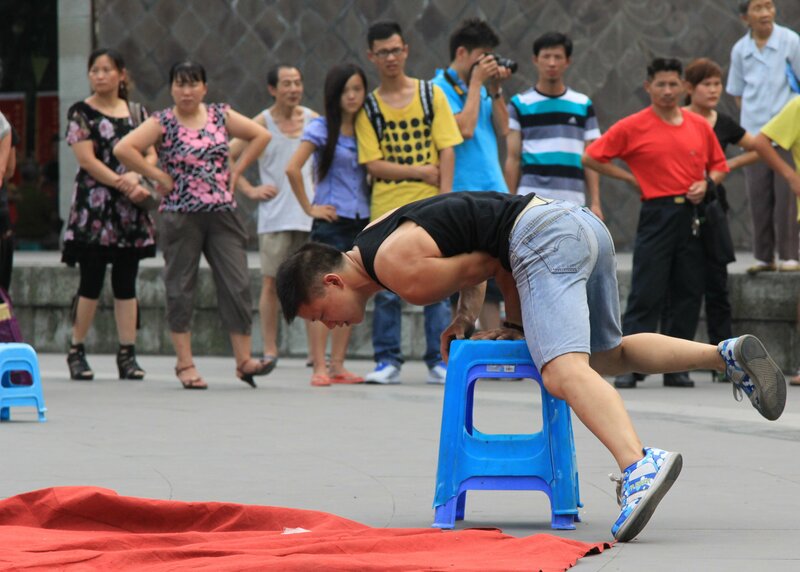 The monk ran out of money and gouged out his eyes to show his sincerity and humility to funders. I can’t imagine a modern contractor doing anything of the sort. Note the tiny people at eye level. 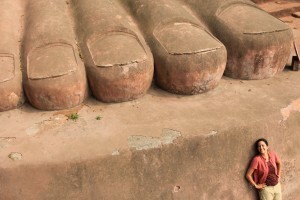 Eventually they completed construction of this 233 foot Buddha and successfully tamed the waters. Apparently, they hewed so much rock from the cliff that it made the river currents settle down. The statue is the largest carved stone Buddha in the world and a UNESCO World Heritage site, but it will always be mega-uber-Buddha to me. Don't get up. Really. It would be terrifying.